At Oak Tree Dentistry, we believe in providing the highest quality dentistry at a reasonable price. As a privately owned dental practice, Dr. Gill is able to spend plenty of time with patients and learn their goals for their smiles – the driving force behind our customized treatment plans. We offer a number of options for working families to comfortably fit their dental care into their budgets. You will find our financial information listed here. If you have a specific question regarding your insurance benefits or cost of treatment, just give us a call! 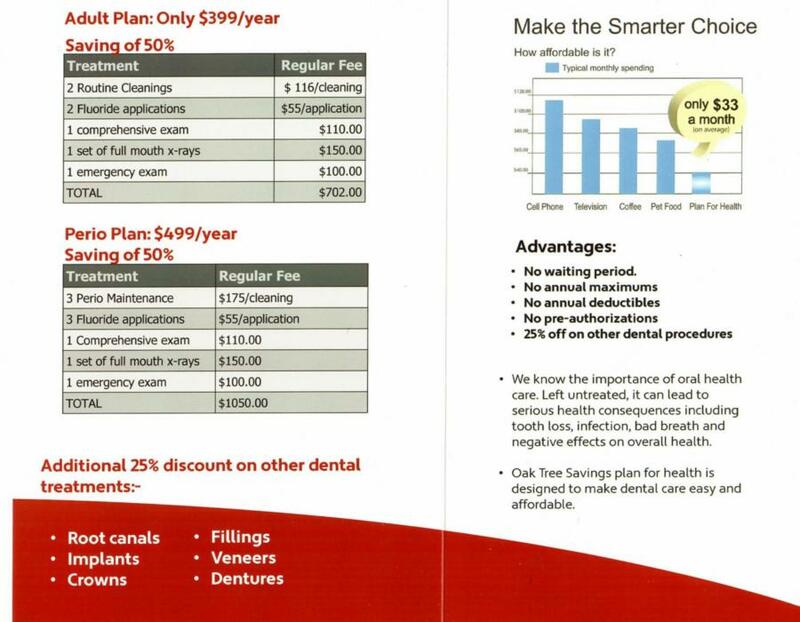 We work with all major PPO dental plans and make your appointments more convenient by filing your claims for you. Some of the insurance companies we work with are listed here. We are constantly updating our benefit plans, so call us if you do not see yours here. When you want to take some extra time to pay off your dental treatment, CareCredit provides both long-term and interest-free payment plans. It is easy to apply online in just minutes by following the link below. You can seek pre-approval for either the full amount or partial amount of your treatment.